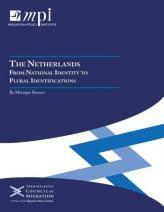 The report finds that new integration strategies advanced by the Dutch government since the official rejection of multiculturalism in 2004 pushes the notion of “culturalized citizenship” — the idea that being Dutch means adhering to a certain set of cultural and social norms — and places the onus on the minority to fit into the existing majority. The turn away from multiculturalism is reflected in policies that deny admission to prospective immigrants who fail a compulsory civic integration exam and limit social assistance to non-Dutch speakers, as well as in proposals seeking to prohibit dual citizenship and restrict attire associated with Islamic traditions. Despite the prevalence of anti-immigrant political rhetoric, findings suggest that Dutch society is deeply polarized with respect to views toward immigrants. Public opinion surveys indicate that many citizens agree that the presence of different cultures represents a gain for society, while anti-immigrant views are seemingly concentrated among the less-educated with less cultural capital. Arguing that national governments ultimately cannot alleviate feelings of cultural insecurity nor govern globalization processes by defining identity in rigid, exclusionary terms, the author proposes a more fluid and open notion of national identity based on shared interests and experiences, norms and morals, and feelings of national pride. The report concludes that such means of plural identification with the Netherlands offer the most promising route to social cohesion.